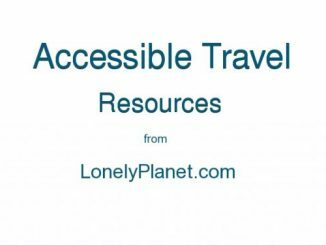 If you’ve read this blog for a while, you’ll no doubt have heard me banging on about accessible holiday accommodation. Anyone who travels with a disability knows, finding accommodation which matches your needs is often the hardest part of booking a holiday, but times they are a changing! 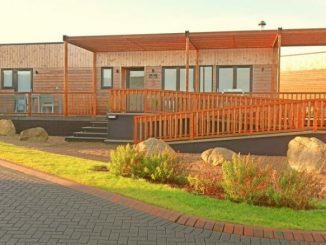 The call to action has been answered, and there are now a number of dedicated disabled holiday accommodation websites. Although I haven’t used them yet, I would still like to give you an overview, who knows, you might find it useful. I would encourage you to support these sites. If we use them, we can help them grow and realise their potential. #1 Let’s start with our friends at Accomable. I’ve written about Accomable on a number of occasions, since the last post I published, Accomable are going from strength to strength. Srin and Martyn are well known in the accessible tourism arena and Acommable has catapulted them onto the world stage. More importantly, Accomable is fast being populated with accessible holiday accommodation from around the world. #2 The Handiscover website is built around their unique rating system, essentially it grades properties depending on your level of mobility. In short, it’s a community-based holiday booking platform dedicated to people with physical disabilities. What I like about Handiscover is that it lists different types of accessible accommodation, including apartments, houses, hotels and B&B’s. The site is easy to use, individual property listings have in-depth information, you can either send an enquiry from the site or some properties allow you to book from Handiscover. From what I can gather, Access at Last, has been around a while, but they’ve only recently come to my attention? To be fair, you can’t be any clearer than that! Access All Rooms works directly with every hotel on the site, this level of involvement allows them to grade each room using the GAAS rating system. I think Access All Rooms has a lot of potential. #5 Angus from Limitless Travel contacted me via Twitter, he was keen to get my opinion on the site. Up front and centre, I like it! I especially like the idea of concentrating on one city at a time, it means they offer comprehensive coverage of each city before moving on to the next. Also, I love the design, I think it’s my favourite so far, and I can’t wait to see what Angus and the team do in the future. Limitless Travel is absolutely worth a visit, especially if you’re going to London. #6 I’m including Access Earth because it’s one for the future.The site isn’t live yet, but it looks promising. I can’t really tell you much about it, but I would recommend following them on social media and await future developments. #7 It would be wrong not to mention Euan’s Guide because I’m such a big fan. Not strictly an accommodation website, it’s still worth visiting if you need accessible accommodation. Euan’s guide is user led, the information is written by the community, people who’ve actually used the accommodation – you can’t beat first-hand experience right! #8 I haven’t spent too much time investigating Hotel Accessibility, but they often crop up when I’m bimbling about online. #9 I do like Oyster Accessible Travel NZ, in fact, if I was designing a destination specific website, this is what I’d want it to look like. In case you haven’t guessed it, it’s all about accessible tourism in New Zealand – who knows, maybe one day we’ll get to visit. 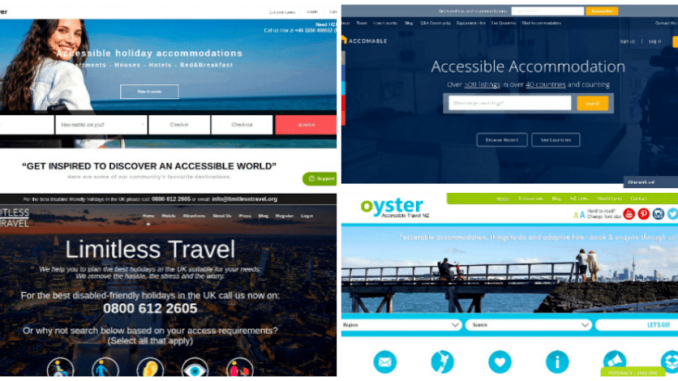 So there you go, a quick overview of accessible holiday accommodation websites. Whether you’re looking for an accessible weekend break or disabled holiday abroad, these sites are a good place to start. I will add more resources as I go along. If you’ve used any of these sites, do let me know in the comments. Please don’t forget CanGoEverywhere.com.au in Australia!